Another A2B Milestone!! The A2B Run passed the 200 mile mark! Steady progress toward the finish line in Boston! Only 3,400 miles to go!! Thanks to family, friends, and followers for the support so far! Looking forward to new discoveries and personal bests going forward! The next two major milestones will come back-to-back. First, will be reaching 300 miles. 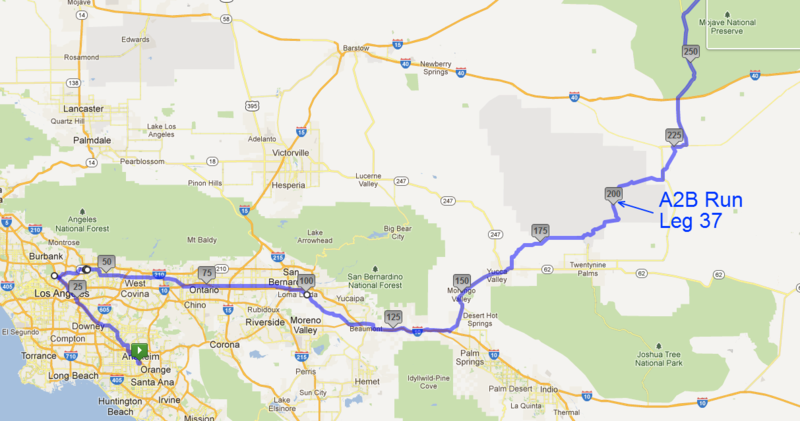 Then, the A2B Route crosses the California-Nevada State Line between miles 309 and 310. I did a little bit of speed work going up and coming down. During the last higher tempo interval, the song “Go Go Power Rangers” popped up on my iPod (a little gag gift from my oldest daughter). So I finished the run smiling and laughing!! As I ran, I anticipated passing the 200 mile mark. I thought about my motivation for the A2B Coast-to-Coast Journey and for running in general. This is a question I ask myself every now and then. I discovered several years ago that there is a direct correlation between motivation and results. In other words, my primary reason for wanting to reach a goal affects how well and when I reach my goal. A pure motive assures that I will reach my goal fully. When it comes to running and A2B, I keep coming back to a video clip that I found some time ago. This video was an entry to a video/print media contest sponsored by Nike. The theme of the contest was “Believe In The Run.” The sentiment and message of this short clip rang true when I first saw it. It still resonates within me. Running towards a big goal helps to remind me of what I believe. I believe that when I think it’s over, I can always dig a little deeper! I believe in redefining my impossible! Your mind, as well as your feet are right on track!! !